Well last weekend did not disappoint with major championships changing hands and new reigns beginning. 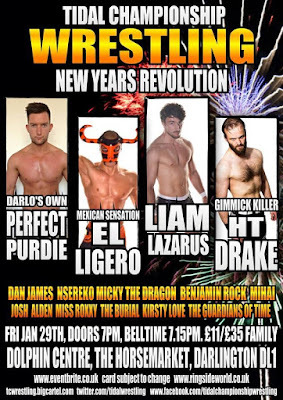 Moving on to this weekend and we see Tidal Championship Wrestling and New Generation Wrestling kicking off their 2016 schedules while Insane Championship Wrestling celebrate their 100th show. Let's get Ready For The Weekend! 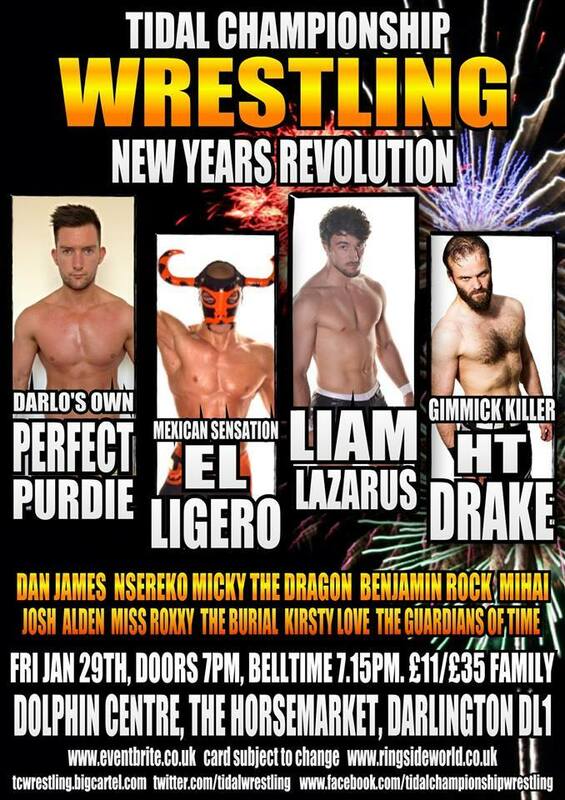 Kicking off the weekend on Friday night and Tidal Championship Wrestling are back at The Dolphin Centre in Darlington with 'New Year's Revolution'. The show will be the first of 2016 for TCW and will see El Ligero defend the TCW Championship for the first time since winning it back in December. His challenger will be Darlington's own, Perfect Purdie. Even though Purdie shall be be considered an underdog to the champion, he possesses a great set of skills, of which Ligero has requested the chance to test himself against. One match on the card with an element of the unknown is Kirsty Love vs Miss Roxxy. Both these wrestlers will be making their first appearance for TCW and shall be wanting to leave a good impression. After a war of words, this match has become a little more personal so it should be expected that the contest will have a bit more spice than your usual competitive match. If you like your wrestlers with an attitude then Dan James and HT Drake are the wrestlers for you. Whilst James may be the TCW Open Champion, he is not what you would call a happy person. The challenger for the championship, Drake is known for having a bad attitude and a general dislike for pretty much everything. So on Friday, the champion may be even more miserable if he loses, or the challenger might see things in a better frame of mind if he wins. But we doubt it. Moving on to Saturday and New Generation Wrestling return to the Pudsey Civic Hall with Full Force and full force the show shall be with a lot of feuds and rivalries being fought over. Two men with a great deal of bad blood between them are Rampage Brown and Zack Gibson. These two men have being going back and forth for a few months now with them both on a quest for the NGW Undisputed Championship. In late 2015, Gibson took a DQ win over Brown which didn't help settle their issues so they will once against meet in the squared circle but this time a shot at the NGW Undisputed Championship will be on the line. Speaking of the NGW Undisputed Championship, Nathan Cruz shall be defending the gold on January 30th in Pudsey. His challenger will be Lionheart, who claims that if their match didn't end in a draw thanks to a mass brawl breaking out, he would have beaten the champion. With that being the case, NGW management have decided to see if Lionheart can back up what he claims. On Saturday night, Cruz puts the championship on the line against a man who says he's got him beat. One other match scheduled for this Saturday will see GenX competitors, Wild Boar and Flash Morgan Webster competing one on one. Each man has a very different type of in-ring style with Boar being a very hard-hitting competitor and Webster known for his fast-paced, high-flying style. While it will be a clash of styles, it'll be also certainly be a full on contest with both men looking to pick up a win and a possible future shot at the GenX Championship. 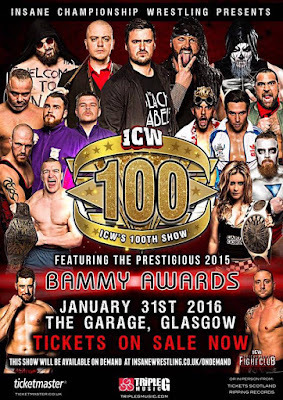 Finally ending the wrestling weekend on Sunday night and Insane Championship Wrestling celebrate their 100th show at The Garage in Glasgow with a Friday Night Fight Club TV taping. Recent tapings of ICW's Friday Night Fight Club have seen some great matches taking place and this Sunday looks to be no different with three championships being defended, two of which will be the first defence of the current champion. Chris Renfrew may have only won the ICW World Heavyweight Championship last weekend but he will be in action on January 31st when his championship will be on the line against former champion, Mikey Whiplash. These two men had issues for a number of months in 2015 with it culminating (or so we thought) at Fear & Loathing VIII in a steel cage match where the NAK faced Legion. However this rivalry looks to be reignited with championship gold being added into the mix. Renfrew has finally reached to top of the mountain in ICW, now he has to fight the monsters that are hunting him and the ICW World Heavyweight Championship he holds. Another champion will be defending their championship for the first time will be Carmel. It seems only fitting that ICW original, Carmel would defend the ICW Women's Championship on such a landmark show. Her challenger, Sammii Jayne is a wrestler that is making a name for herself not just in ICW but in British Wrestling in general. Now under the tutelage of Nikki Storm, Sammii is looking for gold. Carmel has been a part of some of ICW's most historic moments, she will be looking to start her championship reign with a win otherwise she might be part of a historic moment she did not expect. At a previous edition of Friday Night Fight Club, BT Gunn and Kenny Williams put on a show-stealing performances that had everyone talking. So ICW have decided to let both men go at it one more time. It was the former ICW Zero-G Champion, Williams who took the win in their last outing. Gunn will be looking to even the score this Sunday with Williams setting out to prove he's got the number of the two-time ICW Heavyweight Champion.